I was the wrong person for the right story at the wrong time. But I didn't realise this when I got off at Rajahmundry station (location East Godavari district, Andhra Pradesh). I called up Venkat Rao, who owns a plant nursery in nearby Kadiyam mandal. Over a laboured conversation featuring three distressed languages (Telugu, English and Hindi) and two incompetent mobile service providers (Reliance and bsnl), I asked for directions. After a long pause (it was in Hindi, I think), Venkat said he would get me picked up. It will be a silver Mahindra Scorpio, he said. After meeting a series of anguished rural folk in farmer suicide country, this was a shock. I gulped, walked across to a news vendor, and promptly bought a copy of Frontline -- the cover feature was on the agrarian crisis in Maharashtra. The Scorpio was a top-end model but it was the driver who had the sting, as was deduced by many a hapless commuter. But nobody could so much as touch the vehicle, even by means of an angry glare; it flew a flag with Hanuman, in the manner of the chariot of Arjun in the Mahabharat. Inside, there was plentiful bottled water, a cd player that blared music from the Telugu film Pokiri, and air-conditioning. Into my third day in coastal Andhra, I was grateful for the cooling. My dna draws equally from the landlocked Malta plateau and Rajasthan's dry sands. I'm selected to tolerate heat, not humidity. The suv pulled out of town, and moved on to the Kolkata-Chennai highway. All around, the canals were brimming. Soon, the landscape began to change. The rolling paddy fields at uniform height and colour gave way to rows of plant nurseries of diverse shades. Nursery signboards sported titles from within the narrow range of Vaishnav names so common to Andhra. The car came to an abrupt halt in front of a series of sheds with five trucks parked in front of them. We had reached Sri Satyadeva Nursery in Kadiyapu Lanka village. P V Venkat Rao turned out to be a burly man with a weakness for gold accessories. He led me to a shed where several people were waiting, phones ringing and deals being struck with lots of currency changing hands. From amid the market-like bustle, a boy brought two sealed bottles of water. I ran an eye around and saw a truck driver working on his second bottle -- it seemed de rigueur. A talk with Venkat looked difficult as he switched from one phone to the other, asked questions and delivered instructions. But he did join me for a walk. He asked Ayappa, one of 25 supervisors at the nursery who knew some Hindi and English, to join us. Taking visitors around was one of his duties. He was a fixture in the pictures hanging in the shed of chief ministers and other politicians visiting the nursery. Venkat said the nursery was spread over 25 hectares (ha) and employed about 400 labourers in peak season, though some were permanent. There was additional land on lease, but he didn't want to quote figures. Venkat summoned one man and asked him to tell me his salary. "Rs 6,000, saar," he said with a toothy grin. Venkat wanted to show me his computer room. Imagining computerised records, I asked him what the nursery's turnover was. He evaded the question, saying they didn't count the money, and besides, business had been slow. So how many trucks left the nursery each day? "About 10-15 each day in August-September. In peak season, this crosses 100, perhaps. We also supply in Delhi, so if you go to your local nursery, you might end up buying what we send," he said. And there are a few hundred nurseries here, big and small, he said. How is the nursery business so strong here, I asked. We have good soil, high humidity, plenty of water in the ground due to the Godavari's canals, Venkat said. 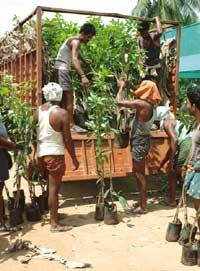 The mandal has always been known for producing quality saplings of fruit trees, especially mango, sapota and coconut. About 15 years ago, trade in ornamental plants picked up, and that took Kadiyam into another orbit. Venkat's grandfather moved his entire family into horticulture in a big way. Now, 15 of his family members work at the nursery. He said his younger brother is currently pursuing a doctorate in biotechnology in South Korea. Why, I asked? We want to get into tissue culture, he replied. There is lot of money to be made there, he said, when his phone rang for the umpteenth time and he excused himself. As he left, I asked him about the changes the Seeds Bill 2004, pending in Parliament, will bring to the trade. He said he hadn't heard of it, and walked back to the shed, leaving me in the capable hands of Ayappa. With Venkat gone, Ayappa talked freely. He introduced me to rows of plants with Latin names. He delved into minutiae, which is when I asked. How was labour so plentiful here? Well, they come from the relatively poorer districts of Srikakulam and Vizianagaram, he said. The next stop was the neighbouring Sri Satyanarayana Nursery Gardens. The owner Pulla Venkanna, secretary of the Kadiyam Nurserymen Association, had gone to Delhi to attend the national floriculture fair. I sought out his son, Ganapati. He seemed well informed. Business is mostly done through intermediaries who come to inspect plants before June, and place orders. They, in turn, supply the nurseries across the country. There were about 15-20 large nurseries bigger than 12 ha, and there were more than 500 small ones. There is no extension advice from the government's horticulture department, and farmers make decisions on plant protection either themselves or based on suggestions of pesticide dealers. I asked him about the total volume of the horticulture trade in Kadiyam, and he said it was difficult to estimate as most farmers didn't maintain accounts. They got breeding material from nurseries as far away as West Bengal (Kalimpong, Kolkata), Karnataka (Bangalore) and Kerala. Considering his connections and awareness, I asked him if he had heard of the Seeds Bill 2004, which will regulate horticulture. He hadn't, and neither had his father. I asked for the number of the president of the association, Taadala Veeraswamy, but was told not to call him as he had had a bereavement. So I sought out the secretary, Gangu Malla Satyanarayana. Satyanarayana's family ran the Sri Satyanarayana Nursery and had 24 ha, besides another 60-odd ha of leased land -- probably the largest nursery in India. Satyanarayana had entered business recently. The man who called the shots was his uncle Babaye. Babaye took me through a short history of the nursery business. Ten years ago, Kolkata and Bangalore led the horticulture sector; now, it was Kadiyam that supplied these places, he claimed with pride. He also explained how the trade had shifted within the mandal over the years. It began at Kadiyam town. 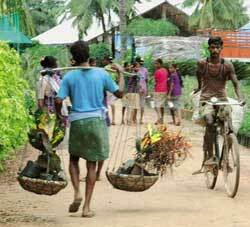 But Kadiyapu Lanka is on the highway, so it has cornered more than 80 per cent of the mandal's trade. He wanted to enter the export market; right now, traders buy from them and export at a premium. He also wanted to be able to import saplings, especially those from Thailand. 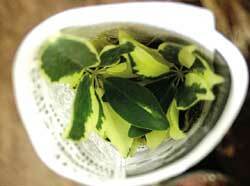 Nurseries in Bangalore and Kolkata import the breeding material and sell it to Kadiyam nurseries at very high prices. I asked him if he had heard of the Seeds Bill. He hadn't, and he asked me what it was all about. I told him all nurseries would have to register with an authority, and would be accountable for the quality of the material they supply. He knew that nurseries in Maharashtra had to register, but he hadn't a clue how this would work out in Andhra. He told me he was coming to Delhi in a fortnight to meet the horticulture commissioner and wanted to use government subsidies. He'd got his son admitted to a biotechnology course in Chennai, thanks to a capitation fee and political connections. He asked me if biotech was the way to the future, seeking assurance. I asked who'd told him about it. Someone educated like you, he said. I gave him the assurance he sought, and caught the train back to Hyderabad.